It's not just about having a website or an app anymore, a strong tech team is essential to staying both competitive and protected in today's rapid market. Hiring a skilled software developer will impact your entire company's growth – which is why making a decision about your engineers long-term requires careful consideration. Once you’ve found the developer of your dreams who is worthy of upgrading your software, how do you get them on board before they get bored and move on in their job search? As technology and skill-sets rapidly evolve in capability and popularity, as does the demand for engineers and developers who can keep your tech updated and protected. With an increasing number of career opportunities in tech available, hiring managers must do more to attract highly qualified candidates for these mission-critical roles. If you're pressed to bring on talent, ask yourself these five questions before you start hiring in tech. First, How Efficient is Your Hiring Process? Do you have the need for speed? Within the high market demand, securing the candidate you need means pacing your interview process ahead of your competition. If you require multiple interviews and laborious coding tests, you will often miss out on top talent as candidates can accept faster offers. While not always accurate, an interview process with many steps gives the impression that working with the organization will come with as much red tape and corporate protocols. Engineers care about moving efficiently and producing results, so it’s important to express a similar ideology to keep their interest in your role. Second, Do You Know What You’re Hiring For? It’s hard to find something when you don’t know exactly what you’re looking for. Before you interview, identify the important tech skill sets and knowledge that you know are required to get the work done. This way, when a qualified candidate comes along, you can move them through the interview process with urgency and confidence. Keep in mind, an entry-level developer and a senior tech lead might have similar backgrounds and competencies, but will leverage them at different levels. Once you’ve identified your hiring needs and found someone who fits your vacancy, you can make a decision you’re not only confident in, but excited about. Start by asking yourself – what are the must-haves for this role? What are the nice-to-haves? What projects will they be working on? 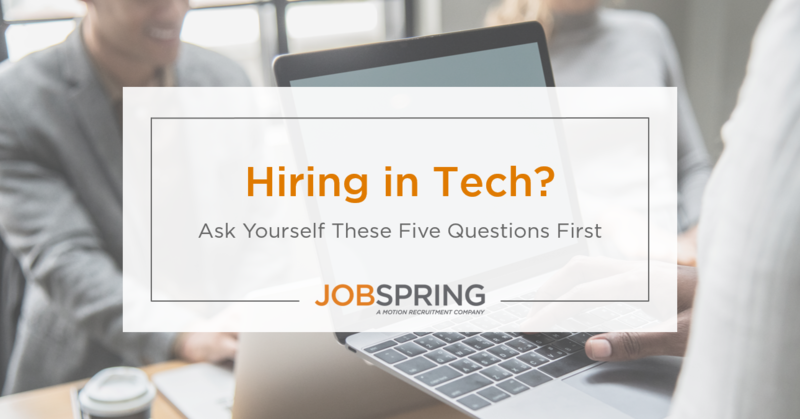 The sooner you figure out the answers to these questions, the easier it will be to focus the job description, cut down on the amount of time you’ll be spend on interviewing tech candidates and expedite the overall process for bringing on your new hire. Third, Are You Hiring for Aptitude or Experience? While yes, you need to understand the scope of the role you’re hiring for, be open to interviewing candidates who don’t have 100 percent of the required skills, but demonstrate the capacity and diligence to learn on the job. Hiring someone with the ‘perfect’ skill set means they might not have room to grow, which can lead to complacency, and position them to seek out their next challenge. As opposed to hiring the most experienced, senior candidate, a junior candidate with 60 percent of the required skills has more room to grow within the role. Engineers love to be challenged; if they’re learning, you’ll retain them longer. They’ll also be more loyal to the company for “taking a chance” on them and finding the time to train them. Ask yourself, why pay a higher salary for someone who will leave after 18 months? While on the topic, there also something to be said for cultural fit. Find someone who will fit in with your team’s culture and compliments the other team members’ ‘soft skills,’ this will ensure the new hire’s success on your team and in the company. Fourth, How Creative is Your Market Knowledge? Tech salaries have grown exponentially within the last decade and show no signs of slowing down. With that being said, it can be difficult for smaller companies to compete with over-inflated salaries. This is where getting creative with your offers becomes imperative. Do your research and reference tech salary guides for your region so you know where your offer will compare to those within your market. Aside from a sky-high salaries, how can you make your offers stand out from the crowd?Offers that include growth or learning opportunities become more attractive. Are you incorporating incentives like flexible hours, work from home or additional PTO into your offers? These perks can go a long way; as can enticing developers with opportunity to work with an emerging technologies. Make sure to include these things when covering and creating your offer package. Lastly, Are You Selective with Your Vendors? Whether you’re working with a MSP provider or a tech staffing firm, make sure to vet your vendors and find ones who are an authority in their field. You probably wouldn’t want to work with a real estate agent based in Tennessee if you are looking for an apartment in New York City. You’d want someone who knows the city, market and can use their connections to find you a hidden gem. Similarly, when partnering with vendors to help with hires, look for ones who are experts in your “market center” including your geographic location, the type of tech you work with and the type of employee you are hiring, for both permanent and contractor tech hires. At Jobspring Partners, we’re committed to helping you build your teams of specialized tech developers, vetting their skill-sets and readiness for your open developer role. Once you’ve ready to new hire, understanding exactly what you're looking for requires careful consideration so that you can quickly identify, and hire, the perfect engineer. If you need help determining your ideal candidate, or what skills are essential to the role, we're here to help. Jobspring Partners, part of the Motion Recruitment network, provides IT Staffing Solutions (Contract, Contract-to-Hire, and Direct Hire) across 11 major North American markets:Boston, New York, Philadelphia, Washington DC, Atlanta, Chicago, San Francisco, Silicon Valley, Los Angeles, Orange County, and Toronto. Jobspring offers a unique and deep expertise in the highest demand tech skill sets, such as UI/UX, Open Source, Microsoft Development, Network Security & Infrastructure, and Mobile Development. Our high-touch, specialized and team-based recruitment model, paired with our deep networks and knowledge of our local technology markets, results in an exemplary track record.